I love giving handmade gifts, but over the years have discovered that my procrastination gene really messes up this plan - it's a little hard to start in November and make 20 different people a nice handmade gifts plus decorate, bake and clean up my house! 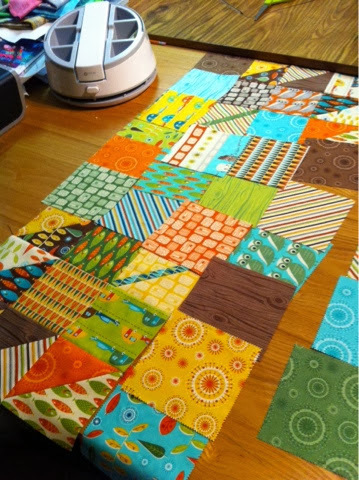 This is one of the reasons I have fallen in love with pre-cut quilt pieces...Jelly Rolls, Charm Packs, Layer Cakes. By starting with one of these you cut your work in half and get right to fun part - sewing. With this in mind I have been working on creating a series of fun projects using a Charm Pack (which is quite economical at under $10.00 most of the time). All of these projects can be finished in an afternoon or evening - including quilting! This is my Fall Charmer pattern. I made this using a S'More Love Charm Pack. (by Cosmo Cricket for Moda Fabrics) The piecing is really simple, and it allows for lots of creative fun as you arrange all the squares to suit yourself - you could do it so many ways! You can see all 8 of my Charm square patterns by clicking the link below - any one of them could be used to make a quick gift that would be perfect for someone special! If you have never purchased a pattern on Etsy before, it's very easy and your pattern is available as soon as you pay! You can actually download your pattern and start your quilt today - talk about instant gratification. Take that, procrastination gene - we are getting our gifts done early this year! Love the runner, I have several charm packs that are just waiting to be used!